A couple weekends ago I taught a class for a Wise Women's Workshop located in the beautiful backyard of a dear friend. Classes ranged from yoga and chakra dancing to herbs for health and sexuality, dream catcher making, meditative drawing, Craneosacral therapy and crystals. I'm honored to have been a part of this two day workshop. Locations for the classes included a tipi, a sacred deck that wrapped around a huge pine tree and a beautiful yurt. I was blessed with the yurt as my meeting space primarily because it has electricity to warm my crockpot of beeswax that we used to layer multiple forms of medium to create one of a kind creations. I thoroughly enjoyed teaching a small group of adults as I'm used to teaching large groups of children. The week prior to class I spent preparing sample projects and finishing older pieces that had been cast aside. I've always been intrigued with using wax as a medium for art and have recently began experimenting and taking classes in encaustics. Due to time limits I decided this class would be focused on beeswax instead of encaustic medium and encaustic paints. I brought an assortment of old books, sheet music, tissue papers, transfer paper, stamps, inks, alcohol and beautiful hand made paper. I gave a quick tutorial in image transfer using the burnishing method over wax and showed how alcohol can do magical things when sprinkled onto wet ink. Every student received one claybord and a piece of 6 x 6 inch plywood cut by my wonderful husband. 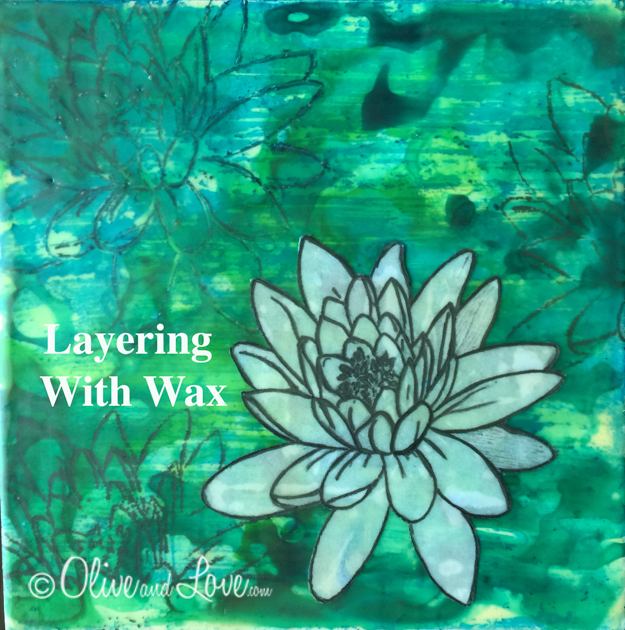 I demonstrated the wax layering process, fusing between layers and using a razor blade to level the surface but due to time constraints I did this process for most of them. The poppy piece was a work in process for quite some time. Image transfer of old music took forever and I lost interest. Teaching this class encouraged me to pull it out from the depths of my studio and pick off most of the cat hair and finally finish. Watching the beautiful pieces emerge from the participants was my favorite. Providing the supplies and watching the magic unfold has inspired me to teach this class again in the future.